Bass Pro Shops Weekly Ad & Sales. 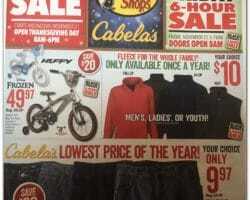 Check out this week Bass Pro Shops Ad sale prices, printable coupons, current circular savings and latest specials. Bass Pro Shops has some of the biggest stores in the market of fishing, boating and hunting gear. The store stocks a vast amount of merchandise with everything essential for the outdoors and is a great place to visit and bring children. They have play areas for kids and bring Santa to store every year in December for pictures. Advantages for adults include price matching and promotions for every outdoorsman or woman interested in outdoor sports like bow hunting, fishing, camping and boating. They sell gear and clothing for men, women and kids, plus an extensive range of quality footwear and provide discounts across departments in store and online. Ship-at-home orders of $50 and more include free delivery and free 2-day shipping is available at only $3. In addition, shoppers who use the Bass Pro Shops credit card when they order online receive free delivery with no minimum purchase required.